I love Lee Valley Tools. I sent them an email on Sunday because several years ago I purchased some “Y” valves from them, the kind you use to connect two hoses to an outside faucet. This spring when I put the “Y” valves back on, they were leaking badly so I sent an email to customer service at Lee Valley asking what I could do to stop the leak. They replied back that they are sending me a refund check. And it has been at least two, maybe three years since I bought them. And thank you to Annie in Austin who gives good advice and shares her gardening knowledge freely in her posts and comments. A while back, I had posted about my hand-digging hoe, and how it was the best thing for removing sod. Annie left a comment that she used a Cape Cod weeder with great success for the same task. So, I bought a Cape Cod weeder similar to this one from Lee Valley, and it is indeed a wonderful tool. I like to use it when I am removing small patches of grass and weeds. I still like the hand digging hoe for the major sod removal chores, but find I am using the Cape Cod weeder a lot, too. Thanks Annie for suggesting I try another tool. I love gardening tools! 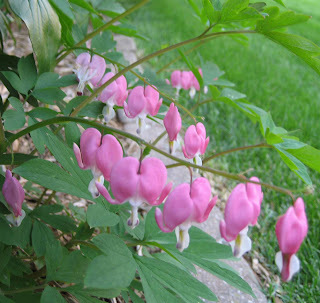 I'd like to also thank my younger sister for giving me the passalong Bleeding Heart plant pictured above. It suffered quite a bit in the "winter of April '07", but has made a nice comeback and is blooming again. And I'd like to thank my youngest sister, too. 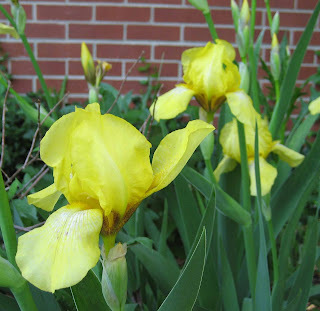 She doesn't know it yet, but this fall, she'll be giving me a start of her yellow irises, blooming now in her garden! I've had the same kind of service from Lee Valley - truly a great company to do business with. Carol — I enjoy hearing your stories of plant sharing among your sisters and other family members. I'm impressed that you are all gardeners. Carol: How many of those iris does your sister have? I think they would look lovely in my garden! Too funny, about your sister 'sharing' her yellow irises! How could she say no to you anyway? We love Lee Valley, too. Every Christmas we have two shopping sprees: one at Amazon and one at Lee Valley. We treat ourselves to all the things we put off getting all year. When we open our presents, we always say, "Oh. Here's another one to you from the Lee Valley elves." Arkansas... I could not agree more about Lee Valley. Susan... We have a rogue sister who doesn't garden, but even she wants a plant now and then. Kylee... I just need to volunteer to "help" my sister in the garden and when she isn't looking, I could dig and divide those irises so that she would never know! M. Sinclair Stevens... The Lee Valley elves are going to visit me earlier this year. I'm placing an order this weekend. We should start a Internet meme about what our favorite purchases from Lee Valley are! Thank you for sharing about Lee Valley. A freind recently told me about them and I received their catalog about a week ago. They have a lot of great stuff. It's nice to know they back it up! Carol, since I'm the one who recommended it, it's a relief to know you liked the Cape Cod Weeder. It would work great for speedily prying up a few golden yellow iris if you have to do any hit-and-run horticulture.